How to sculpt dumplings "pigtail"
Dumplings has won recognition in many countries for a long time, the debate about their country of origin is not resolved to this day. In different countries the ravioli mold different shapes and sizes. 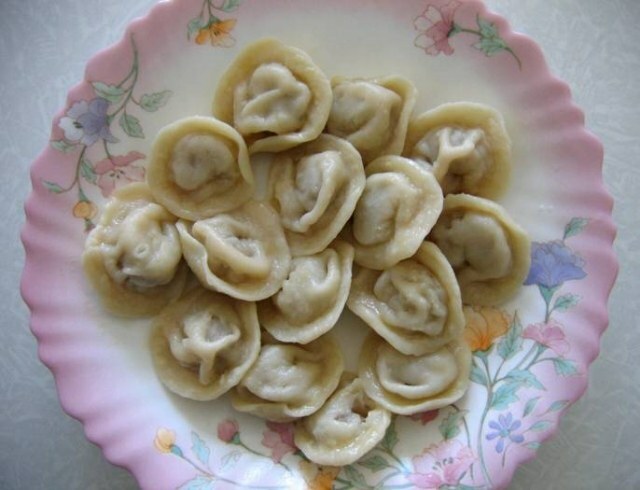 Make a traditional Siberian dumplings, they will appeal to both adults and children. Roll out the dough as thin as possible. Then a glass or a glass, depending on the desired size of dumplings, cut out circles of dough. The second way: divide the dough into small portion and roll them thin strands, which are cut into slices thickness of 0.5 cm and Then thinly roll out each piece, trying to give him the most correct form of the circle. The second way prefer experienced cooks, as it requires some skill. Hold the circle of dough and with a teaspoon put in the center of it a little minced meat - so that when the moulding he did not get out of the dumpling over the edge. If meat juices get on the edge, when cooked, the dumpling will fall apart and the filling of it falls into the broth. Gently and evenly, at a uniform depth of about 0.5 cm, the shape of the edge of the future of the dumpling. When you have a well cobbled together a half-circle with filling, combine the corners and blind them, pulling one to another. It was a real Siberian dumplings. Thus sculpt all the dumplings. Frequent dumpling making they are all the same, as one. Put dumplings in a pot of boiling salted water and cook for 10-15 minutes depending on their size. Correctly molded dumplings do not fall apart. In Siberia, pelmeni are served without broth, with melted butter or oil and sprinkle with black or red ground pepper. In a filling for ravioli, you can add vegetables - primarily onion and garlic, and radish, cabbage, potatoes, and others. Pelmeni mold is not only with meat but also with cheese, potatoes, cabbage or other fillings in accordance with the tradition of the country. Dumplings to store ice in the freezer on a Board or tray, and arrange the already frozen packages. Frozen homemade ravioli can be stored in the freezer for two to three weeks. Dumplings can be served as a soup with meat broth and herbs.